A red dot sight is one of the most useful tools that you can add to your gun, as it allows you to quickly and easily get your gun on target. UTG has released several new red dot sights, and this one has one of the larger objective lenses, while keeping a small overall size. It comes as a complete package, with two QD mounts, lens caps, and everything you need to mount it up to your gun. I will discuss this awesome little optic in this review, so continue reading for more information! I obtained this optic directly from Leapers, however, you can purchase it from various retailers including Pyramyd Air, where it is priced at $49.50 for the whole package. Leapers includes a 2 year warranty against manufacturer defects, and they actually are great about honoring it if you have any problems. For information about their return policy, check out their website. Leapers always has decent packaging for their products, and this sight is no exception. The cardboard box features a foam lower insert to keep everything safe during shipping. Included with the scope are the two QD mounting decks, mounting screws, lens caps, two CR1620 batteries, some hex wrenches, and paperwork, including a basic manual. As mentioned before, this compact optic features a 4 MOA red/green dot that is adjustable for windage, elevation, and brightness. It is parallax free from about 20', so no matter where you put the dot inside the optic, it will be on target. It features hand adjustable turrets for windage and elevation that can be locked to prevent them from getting bumped out of position. The body of the scope is made of metal, and it features glass lenses both front and rear. The emerald coated objective (front) lens is 32.5mm, making this a fairly small optic, but still large enough to view the target easily. It weighs in at 7.1 oz, which is far from some of the really lightweight optics out there, but still a very reasonable weight when mounted on your gun. At 4.2” long, its size befits a full range of guns, from SMGs to full length rifles. 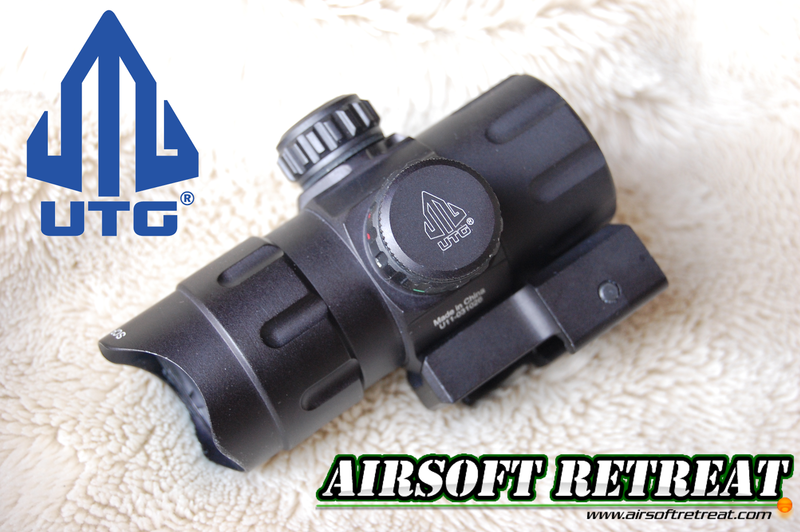 UTG designed the gun with an integral sunshade, which is the slightly scalloped metal extension on the front lens. The included lens caps are basic flip-up units that do a good job of protecting the lenses. I prefer to run my optics without lens caps, but the inclusion of them by UTG is a great touch. The hand adjustable turrets feature easily removable covers which prevent you from accidentally messing up your zero. To further prevent accidental adjustments, each turret has two locking screws which get loosened using the included allen wrench. The red/green adjustable rheostat is located on the left side of the scope, and easily adjusted between the range of brightness settings. This also serves as the battery compartment by unscrewing the UTG labeled cap. Mounting the optic to your gun is accomplished using one of the two QD mounts that are included with the package. 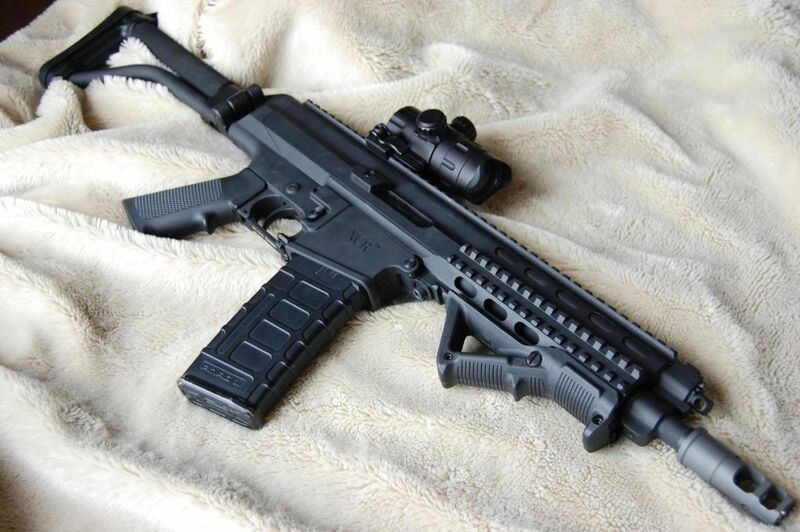 The low mount is better on guns with higher rail positions, such as railed AKs, the XCR, G36 models, etc. The second mount, a cantilever design, is high enough to allow co-witnessing with M4/16 iron sights, and makes adding a magnifier a piece of cake. The mounts are attached to the scope using two phillips head screws located at the bottom of the optic. The QD lever actually holds the optic really well to a variety of rails, and can be adjusted easily if it is fitting loosely. Both the red and green dots are quite bright and can easily be used day or night. On my sample, the green dot is a fair bit brighter than the red dot at its highest setting. I tested the optic on my WASR-10 7.62mm AK for 100 rounds, and it functioned flawlessly throughout. The mount held strong, and the zero didn't waver during my testing, so it should handle anything airsofters can throw at it. Overall, the performance of this thing is great, especially for the price. Yes, as it is a standard red/green dot sight, you can see the diode from the front of the unit, but it isn't a huge issue in anything but the most stringent light discipline situations. Comes with everything you need, tools, batteries, lens caps, etc. That's really about it, this is a great little red dot! I'm always trying out various optics with varying success, however, UTG consistently has produced high quality optics that combine great features with unique designs. This compact red/green dot sight is no exception, and is a great option for both airsoft and real steel shooting. It has become my new default optic for testing and game use, so you can expect to see it on my guns in the future!